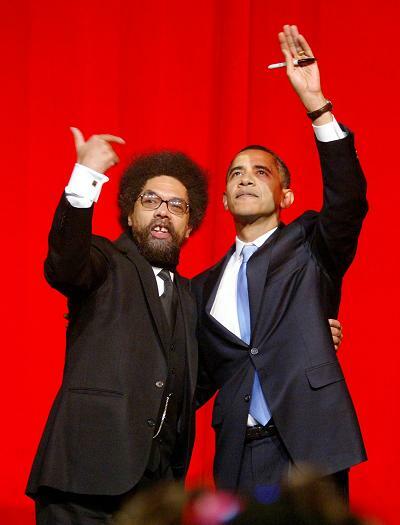 It seems like this moment with Cornel West and Barack Obama hugging and sharing the same stage was so long ago!!!! After reading the Chris Hedges’ article on Monday (May 16th) it will be a long time before these 2 are even in the same building. Dr Cornel West is a respected soldier in the fight for Civil Rights and I mean Civil Rights for more than just Blacks; Dr West is a fighter for the poor. It doesn’t matter who you are, if you are poor Dr West has fought for you. He is the voice for a group that has no voice and I have ALWAYS loved and supported Dr West for his work. It is no secret that Dr West has had issues with the president (WTF/WTH – Dr. Cornel West and President Obama), but this latest attack is the most vicious attack of them all. I have no issue with anyone criticizing the president’s policies but West has stepped over the line with the following statements. WOW…. Saying President Obama “has a certain fear of free black men…” is insane to me. You have to ask yourself how is Dr West coming to this conclusion? What would make someone say that Obama fears free black men? Who are these free black men that Obama is fearful of?? Tavis Smiley and Cornel West???? Hmmmmm…… Maybe the picture is a little clearer now; Dr West and Tavis Smiley are close friends and as Melissa Harris-Perry points out in her rebuttal to Hedges’ article ‘Cornel West v. Barack Obama’; Dr West seems to have taken up for his good friend Tavis in carry a grudge against Obama (Tavis widely criticized Obama during the 2008 campaign for not attending his event “State of Black America’). Dr West would like you to believe these are only criticisms of Barack Obama and that he has the right to do that; and because Obama is Black it doesn’t mean he can be excused from criticism from Blacks folks. The problem here is that West is not launching criticisms against President Obama’s policies, this is a personal attack against Obama. Dr West loves to talk about fighting for the poor and under-privileged and he will say the president has not done anything for those people. Except for…. Unfortunately Dr West is on the wrong side of the fight this time!!! Final Words on Donald Trump…..